The politicians have created a civil war without bullets. Los políticos han creado una guerra civil sin balas. 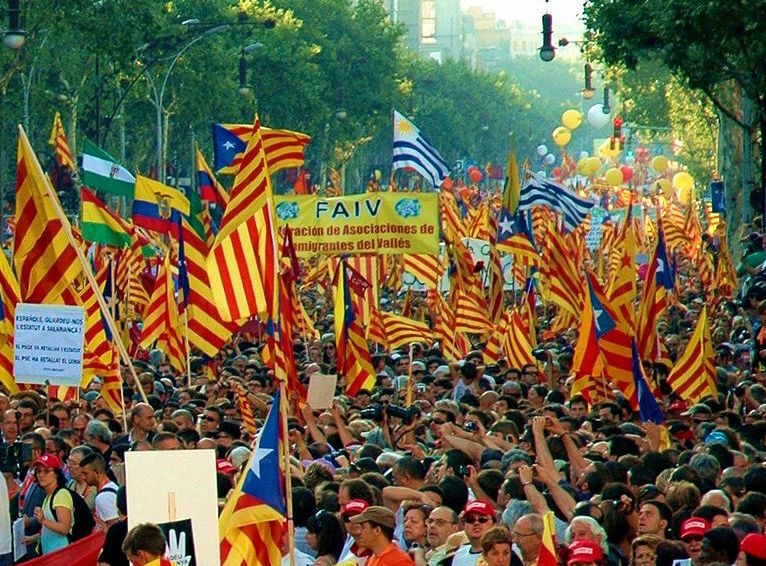 The question of Catalan independence is of course the current hot potato of Spanish politics. To sum the issue up briefly: The current Catalan government is headed by a separatist party and threatens to secede from Spain unilaterally unless the Spanish government agrees to a referendum. The Spanish government, however, flatly refuses a referendum, citing the 1978 constitution (which forbids it). Human nature being what it is, the more inflexible the Spanish government is proving, the more the Catalans want to secede. Demonstrators in support of Catalan independence in Barcelona. Photo by By Lohen11 – Josep Renalias [CC BY-SA 3.0], via Wikimedia Commons. [Bull-fighting] It’s a tradition, let it die. A politician is a reflection of society. Where did the politician come from? Did he grow up in Afganistan? In Italy? No, he grew up in Spain. El político es el reflejo de la sociedad, ¿de dónde sale el político? ¿Se ha criado en Afganistán? ¿En Italia? No, se ha criado en España. The richness of our country is in the cultural differences. La riqueza de nuestro país son las diferencias culturales. Nevertheless España desde el bar is about rather more than the issue of Catalan independence; it explores what the Spanish think about their country, their politicians and each other. As such, it’s a fascinating read for anybody who is interested in Spain. If you want to know what the Spanish stereotypes are about the Andalusians or the Basques… if you don’t believe that Spain is all about bull-fighting or flamenco… if you ever wondered what the Spanish think of the monarchy and the Catholic church, this is the book for you. All the answers you could have ever asked for, straight from the horse’s mouth. And maybe, just maybe, you’ll begin to figure out why the Spanish national anthem famously has no words. As Spain is a country with several regions, all of them with a strong regional identity, disagreements between the regions shouldn’t really come as much of a surprise. But when you read this book, what comes across strongest is how similar we all are in the end: we all want to be happy in this one life we have, we all have the same preoccupations. This book gave me back my faith in humanity: it is possible for people to engage in meaningful conversations about controversial topics, after all, no matter what the politicians (whose stances on Catalan independence are characterised by rigid extremes) or the media would have us believe. And the first step towards understanding is to listen to what the other guy has to say. Let the people in Catalonia say why they are unhappy. Then I’m sure that it’ll be the same as half of Spain or all of Spain, because I’m sure it’s going to be work, money, health… And then we fix it among all. Because neither can you intend to fix Catalonia but screw Extremadura. No, everyone’s quality of life needs to be bettered. Que la gente en Cataluña diga por qué está descontenta. Después seguro que coinciden con la mitad de España o con toda España, porque seguro que va a ser trabajo, dinero, sanidad… Y luego arreglamos entre todos. Porque tampoco se puede pretender arreglar Cataluña pero putear Extremadura. No, hay que mejorar el nivel de vida de todos. So how do you review a book which is ultimately nothing more than collection of interviews? Trying to discuss all the topics the book touches on would make for a longer post than España desde el bar itself. Do you content yourself with a handful of particularly interesting quotes, and that’s it? Or perhaps you interview the interviewer. I wrote to Joan and invited him to have his say about some of the topics his interview subjects talked about – because the thing that struck me was that, apart from a brief introductory note, Joan was entirely absent from his own book. He gave the chance for others to be heard but – in the interest of neutrality – he kept his own thoughts to himself. And so here we are. I can’t afford to hop over to Barcelona to talk to Joan at the drop of a hat any more than you can, so you have to imagine yourself in a bar in Barcelona (I vote for a bar in Port Vell by the sea in the cool of the evening with the lights twinkling in the marina. 🙂 ) Have a bottle of cerveza, a glass of tinto de verano or what you will. And let’s hear what Joan has to say. Where did the idea of travelling around Spain to talk to the people come from? And why did you do the interviews in bars? I wanted to make a film about Spain, to reflect upon and to understand the current situation since there are many conflicts such as regions demanding independence. I was born in one of these regions, in Catalonia, which was going to have a referendum to decide if we wanted to secede from Spain. So I decided that if I wanted to write a script about the Spanish, I first had to document the facts, to know the people in person, interviewing them from one end of the country to the other… and what better place than the bars? The main meeting place for the Spanish where we talk openly about what we think and feel. I didn’t want to commit the mistake of making a film based on the stereotypes and prejudices which society brought me up with. I thought that the interviews from all over Spain would be a good opportunity to give voice to the people… especially after I realised that the experience changed my point of view about the country. Before you began this project, you were in favour of independence for Catalonia – but not any more. What caused you to change your mind? There are many reasons or emotions that make one a separatist, and I wanted independence based on reasons, not emotions. I never felt that my identity should give me more rights than others but I didn’t wish to live in a country where the majority of the people are against everything Catalan, including against petitions of self-government that other regions of Spain already have been granted. But while travelling the country interviewing people I realised that this view was based on stereotypes and prejudices that didn’t match real life. There was someone born in Madrid, in the centre of Spain, but based on his opinions he could have been born in Barcelona, in the region seeking independence. So I decided that there was no sense in asking for independence, at least for the moment. All of us have the same problems, and outside my region people even have it worse. I realised that if we talk to each other, we can understand each other; above all because in many things we are in agreement. In fact, given all I heard, I felt surprised that the other regions aren’t asking for independence. Do you feel Spanish or Catalan – or both? What does Spain mean for you? Feelings always change depending on where you live. I’d like to compare it with a family: sometimes I feel completely part of my family, at other times I leave the house asking myself: “How can I be a member of this family when I don’t feel like one of them?”. I think that national identity works the same way. Sometimes I feel very Catalan, Spanish or even American or Chinese – places where I lived for several months – and at other times I don’t feel like I belong to anywhere, only to myself. Spain for me is a country like any other with the distinction that I know it better than any of the others, because I was born and grew up here; but if from tomorrow there weren’t any more countries I’d be delighted. It’s very much like a utopia but it was also a utopia thinking about democracy when there were still slaves… If we think about what a country means, it’s really sad: all these borders that separate one country from another are wounds in the world made on the basis of wars, blood and a desire for power. I hope that some day these wounds will be healed. How do you see the relationship between Catalonia and the Spanish state, between Catalonia and the other communities of Spain? I like Catalonia, I don’t want them to leave. That the relationship is full of conflict is a fact and while Spain has a government that doesn’t much engage in a dialogue with those who think completely differently and doesn’t permit people to express themselves in a democratic fashion, by voting, it will be difficult to understand each other. Historically, Catalonia has always made Spain better as a country and a society… For example, in 1919 in Barcelona there was a general strike which lasted 44 days for an eight-hour working day, and it succeeded. This time what she’s asking is more autonomy which other regions of Spain already have; and if this right is not granted, it’s logical that Catalonia will wish to become independent as an extreme way of negotiation when other ways of negotiation have failed. As for the relationship of Catalonia with the other communities, I had thought that it was very bad; but having made the book I now think that it’s surprisingly good. If you compare it, for example, with the relationship of the other communities with Andalusia, in the south of Spain, the Andalusians are viewed with much contempt in some parts of Spain. One of the interviewees said: “It seems to me that the politicians have created a civil war without bullets.” And another: “The people no longer worry about unemployment, they worry about Catalonia.” And a third: “Spain creates people who want independence.” Do you agree with these opinions? What do you think the role of the politicians and the media was in creating ‘the Catalan problem’? I think that people worry more about unemployment than Catalonia. In reality, they’re not that worried about Catalonia; they have many more important problems in their day-to-day lives to worry about. But Catalonia is a very controversial topic, full of feelings and very extreme ideological positions, and in general the papers in Spain are not very neutral… same as the politicians who use the conflict to further their career, to divide and obtain power. I do agree that the politicians and the media are creating “a civil war without bullets”: the positions are each time more extreme and people follow political parties as if they were football teams with the politicians their players. And we know that in football the people are moved more by their emotions and not by their reason. It’s also true that the current government has been for years playing a game that only creates independentistas, by denying the right to a referendum and declaring that the Catalans ought to be made Spanish; this is the same as if they said that we have to make the Americans Spanish, or the French, I don’t think they’d like it very much. “9 November. 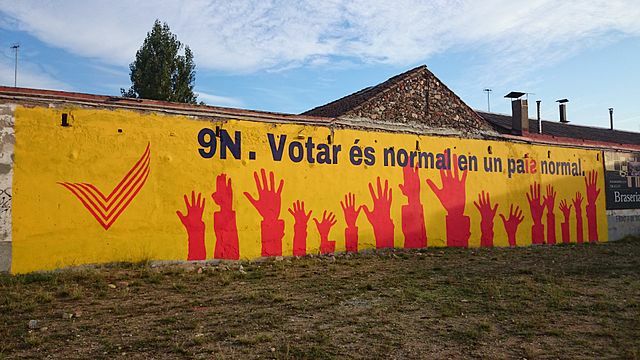 To vote is normal in a normal country.” Graffiti in Sant Celoni, Catalonia, 2014. Photo by Jove via Wikipedia Commons. Many of the interviewees said that Spain is not democratic. Do you agree? It’s more democratic than 41 years ago when there was a dictatorship but it still needs to improve. A country with a king who is selected by descent and not by vote, or a country that does not allow its citizens to vote if they want independence is far from being a completely democratic country. If people from other parts of Spain go to work or to study in Catalonia, should they have to learn Catalan? If you’re not from Catalonia and it bothers you that you have to study in Catalan in Catalonia, well, don’t go there! And that’s all. People look for problems where there aren’t any. Si no eres de Cataluña y te molesta tener que estudiar en catalán en Cataluña, ¡pues no te vayas allí! ¡Y ya está! La gente es que se busca problemas donde no los hay. The way I think is that if I’m Spanish and my son goes to school, well, they should teach him Castilian. And if they demand Catalan from him, excuse me, we’re in Spain. Mi forma de pensar es que si yo soy español y mi hijo va al colegio, pues que le enseñen el castellano. Y si le exigen el catalán, oye perdona, estamos en España. It depends. If they are going to live there, it’s better that they learn, otherwise they will find it difficult to integrate with the locals. 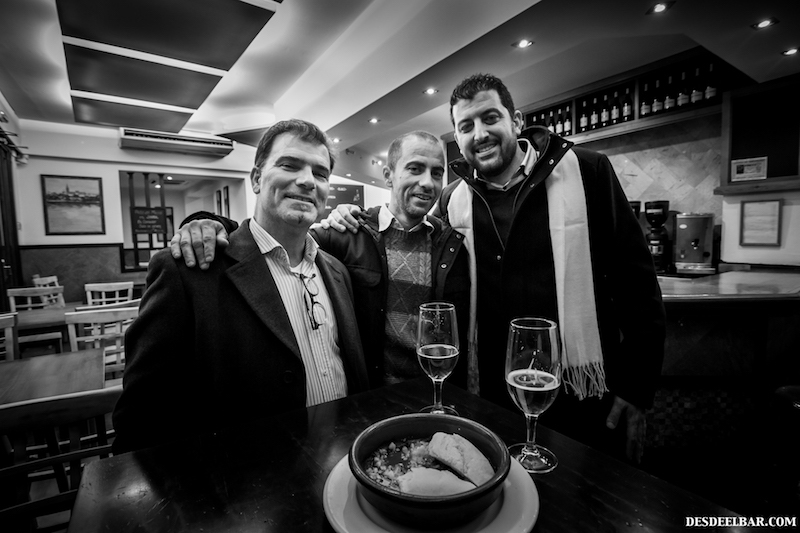 They don’t have to speak Catalan but they need to understand it, it’s part of the social life and culture of the place. If someone doesn’t mind being excluded from Catalan society, has only foreign friends, if he doesn’t mind that it’s difficult to find work on account of not knowing Catalan or that he can’t study some subjects because they are in Catalan… then he can live in Catalonia without learning it but I don’t think it would make for a good experience. You can also live in New York knowing only Spanish and not a word of English, and it would be the same as living in Barcelona without knowing Catalan, except the buildings are not as high. We have to respect the languages and cultures of the other regions of the world, as long as they don’t harm anyone, it’s essential for a good co-existence in the world. What do you think about bull-fighting and the fact that it’s forbidden in Catalonia? It’s a spectacle that would be wonderful if they left out the mistreatment of the animal, if they only dodged and jumped the bull without hurting it… The killing of the bull as a spectacle to me seems cruel, a practice that ought to stay in the past. The bloody spectacle of the bull reminds me that the human race is still in the beginning of its existence, enjoying its more violent instincts rather than its intellect. It seems ideal to me that they forbade the mistreatment of the animal in Catalonia and in the Canary Islands, although I would have preferred if it was a decision taken by the citizens with their votes and not directly by the politicians without consulting the people and offering a middle solution, the spectacle of bull-fighting without mistreating the animal. Thanks for your comments, Colette! I’m really glad you liked the post and the interview. I never thought to ask Joan about the minutiae of the process of interviewing all these people – but my impression was that it was done as a live conversation… unlike my interview with him which was conducted via e-mail. As for the art gallery idea, you know what, I agree. 🙂 I think the black and white photos of the interviewees are great, and when I first looked at the website last year (it’s changed now), it used to have some of these photos, each with a quote… visually it was very attractive. I could see it making a very good photo exhibition in a gallery. Thanks for bringing this to us. Fascinating!